Source: Kenan Memorial Fountain, Wilmington. Photograph courtesy of Natasha Smith. The fountain, which is approximately fourteen feet high, was given by William R. Kenan, Jr. in 1921 in honor of his parents, Captain William R. Kenan, a Civil War veteran, and his wife, Mary Hargrave Kenan. It features a large central fountain composed of a bowl on a tall pedestal or stem sitting in a larger round basin. This entire structure rests atop a first tier which is divided into eight segments around the entire square structure. The center segment on the four sides forms a bench, and the fountain pools are located on either side on the corners. The water from the pool cascades into these basins, and carved fountainheads, in the shape of gargoyles and other classical figures, spray water into the center of the pool from the lower basins. Carved terrapins sit at the bottom of the central pedestal. North Face: KENAN MEMORIAL FOUNTAIN / ERECTED 1921 / THROUGH THE MEDIUM OF THIS BRONZE TABLET, AUTHORIZED / BY WILMINGTON CITY COUNCIL AND PLACED IN 1953 A GRATEFUL / CITIZENRY EXPRESSES PROFOUND APPRECIATION FOR THE / ACTION OF MR. WILLIAM R. KENAN JR. IN PRESENTING TO HIS NATIVE CITY / THIS LOVELY FOUNTAIN. IT IS A BEAUTIFUL MEMORIAL, CONCEIVED / IN FILIAL GRATITUDE AND DEDICATED IN MEMORY OF HIS BELOVED / PARENTS, CAPTAIN WILLIAM R. KENAN (A GALLANT SOLDIER OF THE / CONFEDERACY), AND MARY HARGRAVE KENAN. Campbell, Walter E. 1996. Across Fortune’s Tracks : a Biography of William Rand Kenan, Jr. Chapel Hill: University of North Carolina Press. 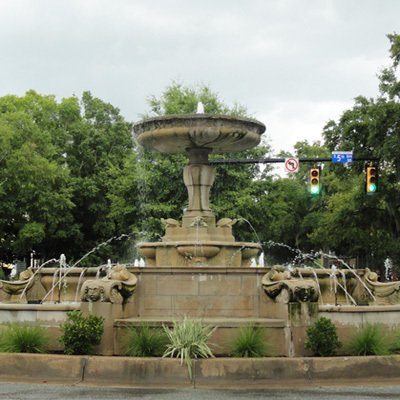 William R. Kenan, Jr. had the fountain constructed as a gift to the City of Wilmington in memory of his parents, William Rand and Mary Hargrave Kenan. Born in Kenansville, the senior Kenan was a captain in the Civil War, originally enlisting in the Duplin Rifles of the North Carolina 43rd Regiment. After the war, he became a life insurance salesman in Wilmington. A prominent member of the Wilmington community, he became a trustee of the University of North Carolina in 1903. He died shortly after this appointment in 1903. His wife, Mary Hargrave, was a native of Chapel Hill. With the rise of automobile traffic after the 1920s, the streets that surround the fountain became much more crowded and members of the city council proposed removing it to widen the street. Its removal was debated, but after strong protests from the New Hanover Historical Commission, the city decided to shrink the fountain by removing the benches and lower pool around it in 1953. Since then, the fountain continues to be the focus of accidents and calls have continued for its relocation. 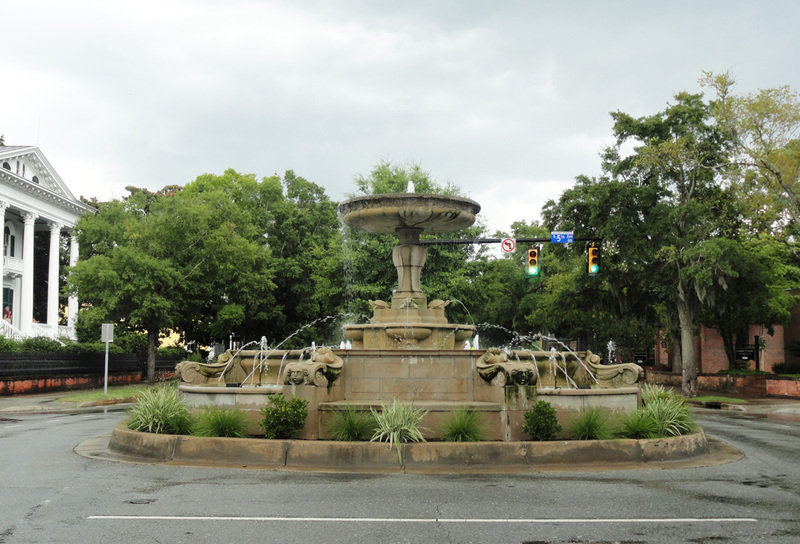 In 2012, after renewed debate following a number of accidents, the Wilmington City Council approved $10,000 for additional lighting around the fountain in an effort to curb accidents and damage. The fountain is located in the center of the intersection of Market and 5th Streets. The fountain sits in the traffic circle with four lanes of traffic on both streets.